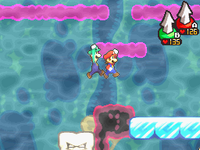 Airway is the final area of Bowser's body that Mario and Luigi explore in Mario & Luigi: Bowser's Inside Story and its remake. It is unlocked when the Pump Works is completed. It is apparently located in Bowser's lungs and trachea. 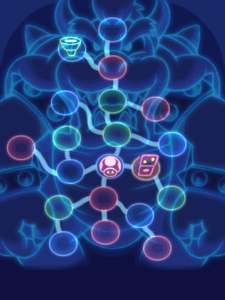 The airway houses all of Bowser's DNA and is the place where the Dark Star is fought. In order to progress through the Airway, Bowser must inhale a stream of ice from Blizzard Midbus's snout, and alternate in-between to get to the end of the area. The Dark Star slowly progresses through and takes in Bowser's DNA as it goes through. First, it acquires his fist, then his flame breath (but in a more dark flame than bright red), and finally his shell to ground pound. When the Bros. finally make it to the area where they fight the Dark Star, he has the complete look of Bowser, without the legs. The Emoglobin that hosts The Gauntlet suggests that players that want to level up very quickly should battle the monsters in the Airway. Here is a list of overworld items found in the Airway in Mario & Luigi: Bowser's Inside Story. The fourth scene from the start is a hub, and so is the one to the right of it, which will be denoted 0. The scene to the right of scene 0 will be denoted 0R and the one to the upper of it will be denoted 0U. Ultra Mushroom x2 In a ? Block in the fourth scene from the start. x2 In a ? Block one scene to the right and then one scene lower from the fourth from start. 1-Up Deluxe In a ? Block in the third scene from the start. In a ? Block six scenes to the left of the fourth from start. In a ? Block two scenes to the right of the fourth from start. In a ? Block in the scene above scene 0R. In a ? Block two scenes beyond scene 0U. Ultra Nut x2 In a ? Block four scenes to the left of the fourth from start. Max Nut In a ? Block in the scene above scene 0R. Supersyrup Jar x2 In a ? Block one scene to the left of the fourth from start. In a ? Block in the scene to the right of scene 0R. x2 In a ? Block two scenes beyond scene 0U. Star Candy In a ? Block in the scene above scene 0R. Retry Clock In a ? Block one scene to the left of the fourth from start. In a ? Block in the scene above scene 0U. King Wear In a ? Block five scenes to the left of the fourth from start. Guardian Socks In a ? Block six scenes to the left of the fourth from start. Rugged Socks In a ? Block in scene 0U. Star Wear In a ? Block two scenes beyond scene 0U. There are 8 Beans in total. If the player saves while the Dark Star is in the Airway, the last sentence in the save message says that the Airway is called the Air Space, the Japanese name for the Airway. This was resolved in the remake. This is the only large area in Bowser's body without Attack Pieces. There is an area in Mario & Luigi: Dream Team that is very similar to the Airway called Dreamy Mount Pajamaja. Once again, the player has to freeze and thaw out geysers to advance. This page was last edited on April 9, 2019, at 17:05.